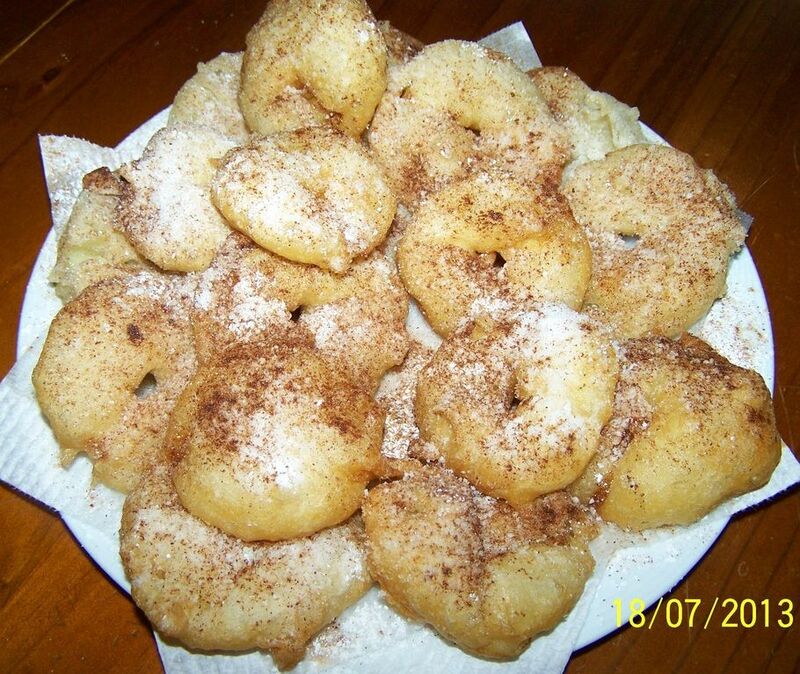 My family call these Apple Doughnuts. Rather than buy shop doughnuts my 6 year old wants these instead. These are delicious, especially when hot, and the batter is crisp. So simple to make, so quick to make. While the oil is heating up, you prepare the apples and batter, cook for three minutes and you're done. I prefer red apples (any type) as they are naturally sweeter, my kids love green apples, I just need to dust them with extra sugar. But usually it is whatever apple I have in the fruit bowl, a mix of any apple really. I love mine dusted with cinnamon, as the combination of apples and cinnamon for me is amazing. My family eat them as is, but you can have them with vanilla ice cream if you prefer. The recipe originally says to slice the apples 5mm in thickness, I prefer 1cm, the reason is, I like to taste the apple, not just the batter. Having said that I don't measure. But I prefer to slice a little thicker so you get more of an apple taste, with a little bite still. 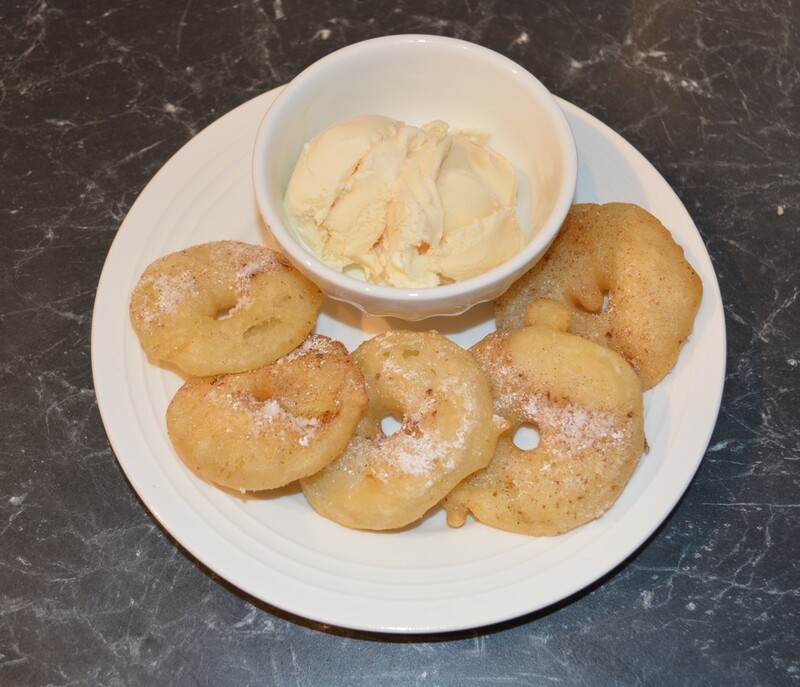 If you have a few apples in the fruit bowl, give this recipe a try, simple, yet so good. Cut the apples crossways into rings about 5mm-10mm thick. In a medium mixing bowl add the flour and salt. Add the beer and whisk until you have a smooth batter. Using a medium-large saucepan, fill it with oil until 5cm deep. It is not necessary to have too much oil for the deep frying. Heat it to 190C. I personally don't measure, I test with cubes of bread, when the bread sizzles once dropped in the oil, it's ready, if the bread burns too quick, it's too hot. Working in batches, do not over crowd the saucepan. Dip the apple slices into the batter, I just tap the apple to the side of the bowl once to remove any excess batter, and carefully place into the hot oil. Fry for 1 1/2 minutes on one side, flip over and fry for another 1 1/2 minutes or until crisp and golden. Total cooking time is 3 minutes if your oil is at the right temperature. Transfer to a large tray with paper towels, to drain of any excess oil. Dust generously with icing sugar mixture and cinnamon if using. Serve hot with or without ice cream.